I actually carried out what this post is about a couple of weeks ago but work and other things have kept me from publishing this post…mainly as until this morning I thought I already had! In a previous post I told you all about the artwork and article Sam Croes and I had created for Irregular Magazine. Sam based the artwork on my description of the giant fighting machines of the 22nd century. I thought the image was so awesome that I had it printed at a very high resolution and then framed by Green Jam here in Girvan. Green Jam do an excellent job in framing, highly recommended. Its an A2 sized print in top grade ink on a thick vellum like paper which is a little raised for a rich feel which was then fitted into a wooden frame with white border. 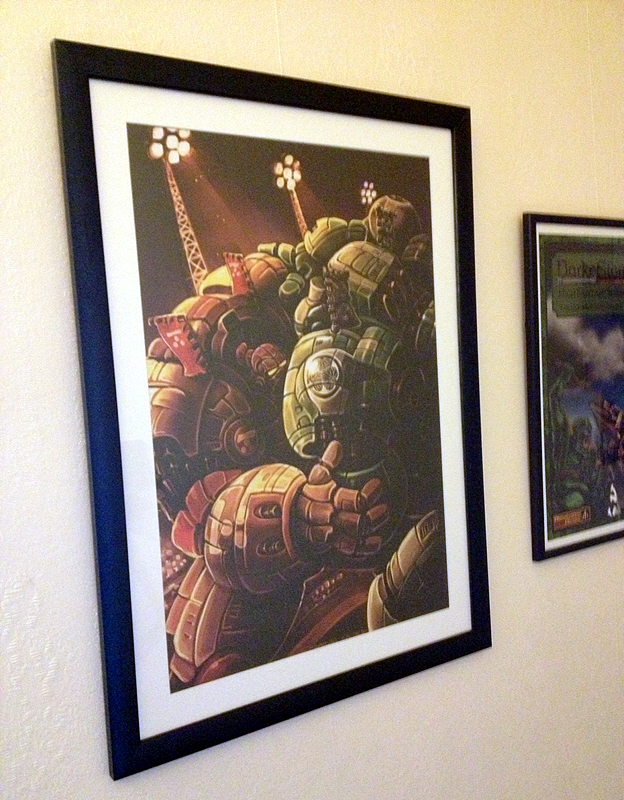 Normally I only place frame prints of my wargame titles on the walls (you can see DarkeStorme to the right of the Robo Basho picture) but I made an exception here. Eventually wall space will run out but for now I am gold as they say. Sam saw the print when he was here last week and he liked it a lot. 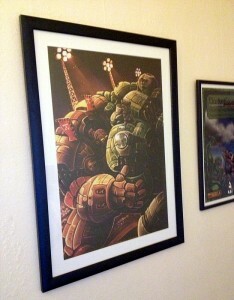 I offered to send him another A2 sized print if he desired it, perhaps he shall. 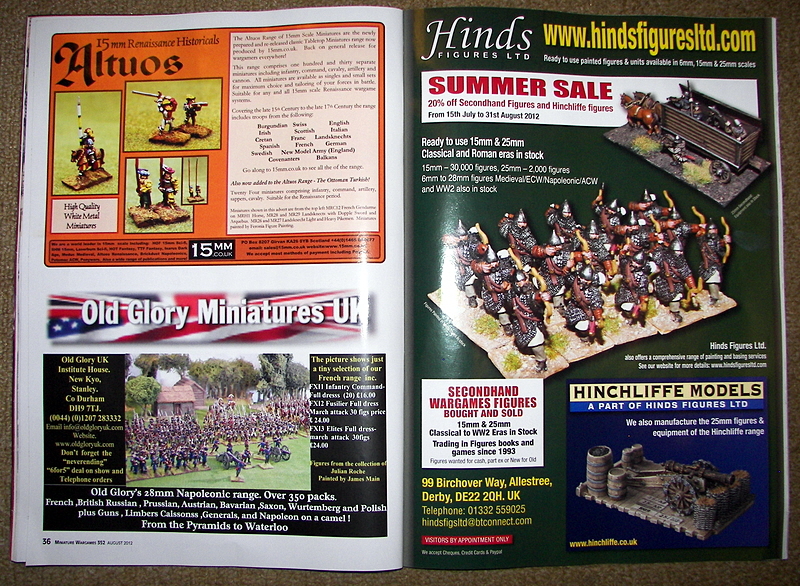 Advertising in Miniature Wargames Issue 352 – Results! 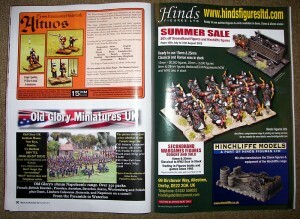 Following up on last months look at the result of 15mm.co.uk advertising in Miniature Wargames Issue 351 it’s time for a round up on the advert placed in Miniature Wargames Issue 352. 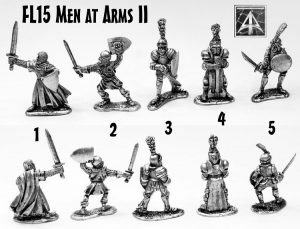 You can follow the link backs to previous posts to see those results and the advert in question but it was an advert for the Altuos 15mm Renaissance range of white metal historical miniatures. Last month’s look at the results of magazine advertising were positive in fact 15mm.co.uk has continued to receive orders citing the USE ME advert right up to this week. So quite happy there. However the response to the Altous advert have been quite frankly a disaster. Enquiries and orders citing the advert were virtually non existent and the level of sales for the Altuos range actually fell 25% overall during the calendar month of the advert. How the advert actually reduced sales is beyond my ability to understand but I expect (and hope) they were not connected. Web views on those pages relevant ran about 10% down on the month before but total visits remained the same. Based on the results of last months questionnaire on the Notables Yahoo Group it seemed that outside of the UK few read MW magazine and many prefer to get content online too. But there was a solid core of players who read it each month. The 15mm Renaissance range is fairly popular for 15mm.co.uk. Not on the same level as HOF 15mm Science Fiction and Laserburn but it more than holds its own for players of FOG and DBM and so on in the historical gaming clubs and societies across the world. Frankly this has left me rather glum and puzzled. Comments and thoughts welcome on this by reply or by email. 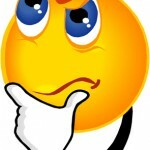 So what is the link between advertising and figure / rules choice for wargamers? I got my advertisers copy of this months new Miniature Wargames magazine in the mail on Monday so I have it fairly close to those who line up at WHSmith newsagents at the weekend. Now that the carnage of the The Thinker’s tenth birthday is over I can do a wee look at this issue. So without further ado…. Cupola: Andrew Hubback does his editorial commentary as normal and this time he announces or hints at a refreshed design for the layout of MW coming next issue. I look forward to seeing the rests of his feedback from the readers. Feedback is vital in all industries and I often feel as if I operate in silence because if the customers who buy my titles and miniatures do not tell me what they think of them or what they would like to see it is really tough to improve! Letters Page: Good letters in this month especially one from John Treadaway (ah..fond memories of Full Thrust!) concerning the lack of non-historical materials in the magazine (not just MW but focused on it). While this can mean Fantasy and Science Fiction it also means ‘what if’ scenarios from history too. This is an important point to take up. MW own survey last issue showed how much non-historical gaming there was at Salute 2012 and I commented then about its importance to the future of the industry especially among younger wargamers. Boxing Clever at Fisticuffs: Nigel Pell and Gary Mitchell report from the Fisticuffs show in Weymouth (south coast of England). A good read this and its always good to hear of the joy and suffering that wargamers go through getting to shows. I have not been to Fisticuffs (it would be a thousand mile round trip from Girvan!) but it looked like a fine event with a lot going on including a large game of GrUnTz put on by the Wessex Wyverns local club plus of course Gary’s own excellent Space Vixens from Mars was there; love that range! The Attack on Raedykes Camp: The third article in the series by Peter Hall on re-fighting Mons Graupius with the Hail Caesar wargame rules. This time a Roman Marching Camp hobby article and run through of two games centred around it. I studied this campaign at university and Peter does an excellent job in turning it to wargaming. 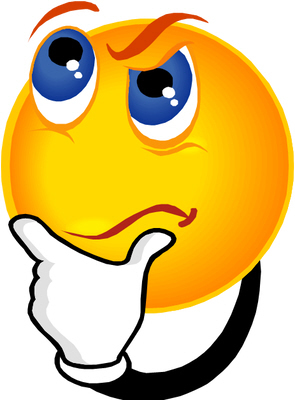 Apocalypse Vow: It is going to be the end of the world on December 21st this year if you believe the long vanished Mayans. This article by Gary Mitchell looks the this prediction along with Mayan warfare and ways to use it on the tabletop. As to the end of the world…no way…I still got rules to write! The Osaka Campaign: Part two, and sadly the final, of Kevin Jones look at the rise of the Tokugawa family and the Japanese feudal wars. One of my favourite nations and a period I know a lot about and in fact I own almost of the books the author quotes as sources. 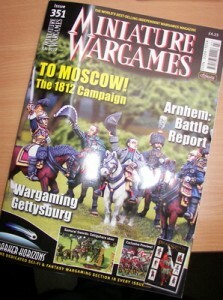 An excellent summary with some wargaming notes and ideas too. Scuffle at Shevardino: Napoleon’s 1812 campaign and the smaller battle that came just before Borodino written by Chris Hahn. This is a fine article with a lot of history, maps and wargaming material in it but it did not grab me much. Perhaps I am not in a mood for Napoleonics just now (I am busy with my preparations for a ‘Martian’ terrain set for 28mm scale but that is another matter) so I read it and passed on. 15mm.co.uk’s advert for Renaissance miniatures..gosh it almost looks like a professional did it! Don’t Forget Your Tomahawk: I always look forward to Steve Eardley’s pages in MW because he ranges wide and far for material and always delivers a good read. This time its an approach to wargaming the French and Indian War (or the Seven Years War if you come from the civilised side of the pond!) followed by a delve into the miniatures that can be had for the conflict. Four excellent pages! Wargaming Gettyburg Part Two: Jon Sutherland offers up the second part of his series on wargaming the biggest battle of the American Civil War. It is a well delivered and sharp article which is just as well as I am fairly tired of ACW as a period and of that battle in particular. Good for fans of the period. France 1940: World War Two booty for fans of the most recent worldwide conflict. Mark Freeth presents a report on a battle that recently took place at his Wargames Holiday Centre. It reads like a plug for the place but hey its a good plug and I for one would love a weekend of Mark’s hospitality! A Spreading Insurgency: Mike Haran presents a system for wargaming the action when the recent Arab Spring turns to a cold, cold Arab Winter of war and terrorism. For me this near future article is the best one in this issue. Presenting a squared grid of the Middle East and surrounding regions along with outcomes allows for massive variety and unknowns in play. Added to this is a system of unit deployment, spies, situations. Excellent all around and could be adapted to a sci-fi setting with ease. Darker Horizons: This time headed up ‘Redundancy’ Gary Mitchell begins my favourite part of the magazine by outlining his potential woes of facing the loss of his teaching post and having to do the ‘trolley shuffle’ so loved by the middle aged all across Britain’s thousands of supermarkets. I wish him luck and while its not the purpose of this posting or this blog to get political it does make you wonder if teaching children is about experience or being cheap…ah but lets carry on. Gary crams and I mean crams information into the pages listing all the current happenings of two dozen companies and fifty or more releases. Black Cat Bases get a feature of their new ‘between scales’ Grey Aliens and Sheep while some other person gets a mention about his ‘amazing sci-fant empire. I wonder where he finds the time?’…what can I say, not much sleep, fast typing, a strong work ethic and a loving wife. MOTH and Me get a mention! Book Reviews: A collection of reviewers look at Twilight of the Hellanistic World (Pen & Sword), The Fall of English France (Osprey), Austrian Seven Years War Cavalry and Artillery (Ken Trotman Publishing), Napoleons Swiss Troops (Osprey), Forts of the War of 1812 (Osprey), The Eastern Front 1914-20 (Amber Books) and a biography of Georgy Zhukov (Osprey). Good reviews but all I can say is thank heaven for Osprey eh, otherwise what would the review pages do! 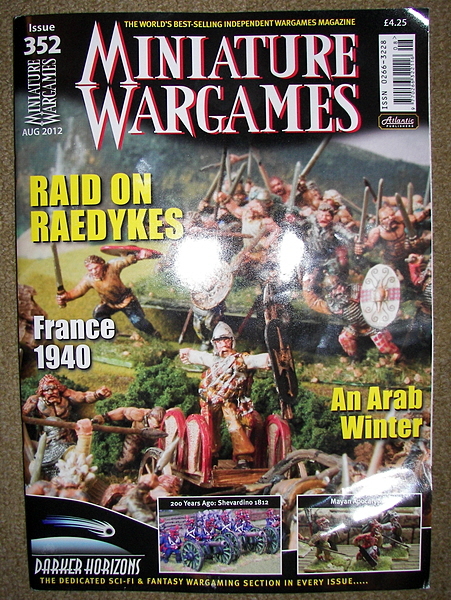 I often think that a wargames magazine should review wargame rules as well as military history books in its pages; after all it is aimed at the wargaming hobby. All in all a good read and recommended for those of you who can get it. But then I would say that…I am in it! It is that time again. 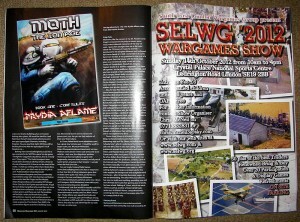 A wee bit of graphic design to create an advert for the August 2012 Issue of Miniatures Wargames magazine. I used the same basic shape and template that I did the Issue 351 or July issue but the subject matter is rather different. 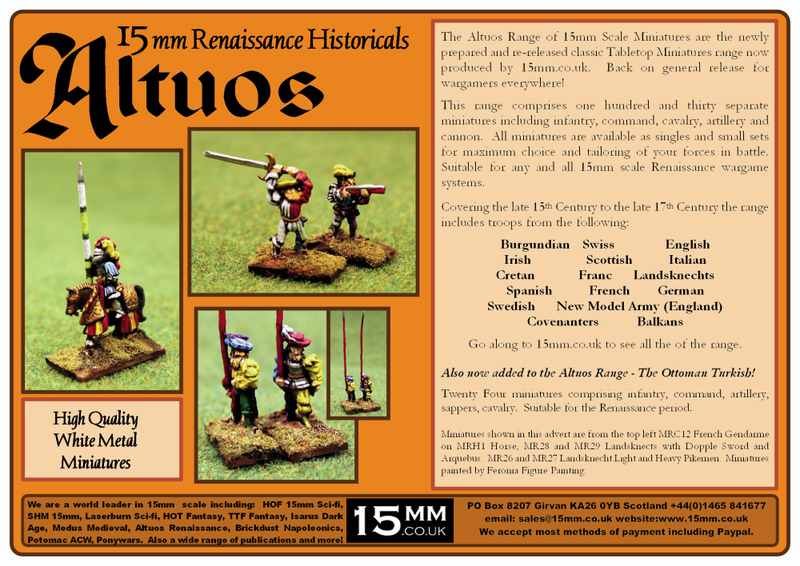 This time the whole Altuos range of 15mm Renaissance Historicals gets the glossy treatment that it has so long deserved. Expect to see this one in the shops in a few weeks time at most. Click on it to see it larger. Some people have told me that magazine advertising in the wargaming industry is as dead as a dodo since everyone now only wants to look at blogs and online groups for their news and ideas. Perhaps this is so but we will find out. Some of those same people have said that one of the worst ideas is to advertise something as unfashionable as 15th to 17th century historicals but lets just say that I not only have faith in this superb range brought back from dusty ruin but also that I like a challenge. I have done my best so it will be up to MW and Andrew Hubback to see if 15mm.co.uk will see a return on this advert. But its not all about money, far from it. These are super miniatures and they were for the most part VERY popular in the 1980’s. While part of the range has been re-released for some time I have not gotten around to the rest of it but knowing this advert is steaming towards the presses will make me hurry up! To that end expect a posting on this very blog about inky hands and a load of photos of 17th century figures and artillery real soon. I know that at least two dozen of you who regularly read this blog have asked me via email why I have not yet reviewed the current issue of Miniature Wargames. 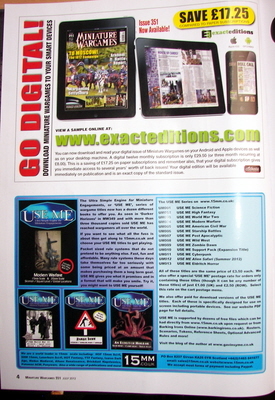 After all you say ‘you are in it’ and it features an advert for the USE ME series from 15mm.co.uk which was reviewed in MW349 back at Salute 2012 time. Well it has been out for more than two weeks but I only got my copy a week ago in the mail. By then I had missed my ‘early morning weekend review’ slot which I use at the weekend while the kids are asleep to tell you all about magazines, books and films. I have a little time now so here is a brief outline of the magazine and what I found most interesting about each article therein. John Walsh begins his coverage of the 200th anniversary of Napoleon’s disasterous campaign in Russia with the lesser known action at Krasnyi. This was a very informative article full of good wargaming ideas. I have a lot of knowledge of this period and campaign including many text books and Mr Walsh does it proud. Plus this is the first article with its OOB’s and so on available as downloads on the Miniature Wargames publishers webpage. 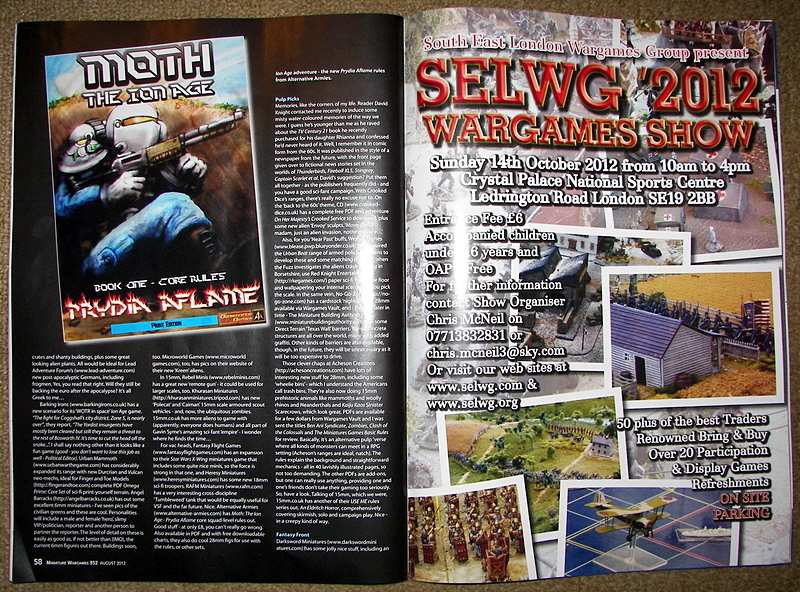 Andrew Hubback and Gary Mitchell co-author a four page article with their take on the pinnacle UK wargame show. This went into a lot of detail and contained a lot of information that, though I was there, I did not know. A pie chart of the popularity of periods and scales showed that 28mm and Science Fiction are in the ascendency and 20mm and 19th Century gaming are the smallest sector (as far as Salute games go). Gary also singled me out for praise on the last page of the article which was very kind of him. I do my best and it was a pleasure to meet him and Andrew. 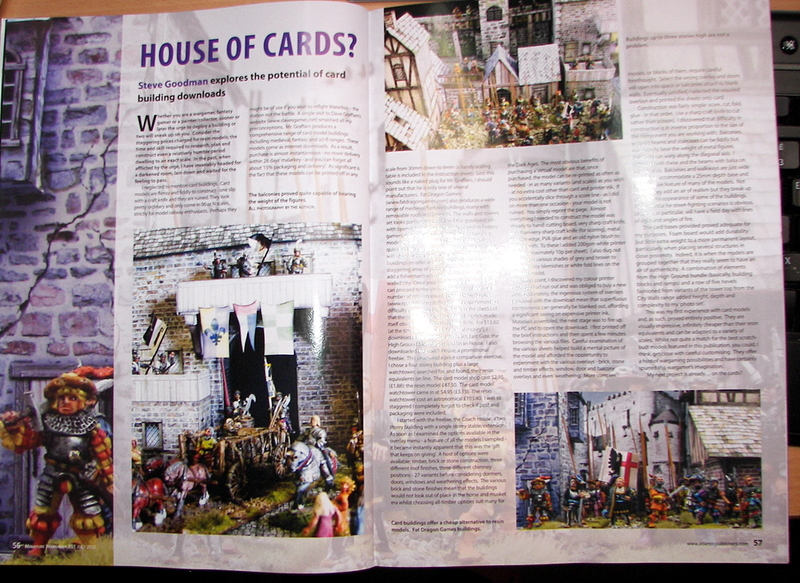 Five pages given over to glossy coverage of Warlord Games new title for 16th and 17th century battles. Very pretty and very nice to read but a touch expensive for me at thirty pounds. But 15mm.co.uk will soon have the entire Renaissance range out which covers this period and I have an idea for a USE ME series title for the period too. Budget gaming a plenty! Kevin Jones goes to one of my favourite nations and one of its most interesting points in history for his new series of articles on 17th century Japan. The rise of the Tokugawa clan over all the other warring diamyo of Japan is a dramatic tale well suited to tabletop recreation. The Battle of Sekigahara is the focal moment of this article and it plus its build up engagements are well detailed. The battle itself is outlined and briefings given for the commanders plus a column on rules variations. Excellent and I look forward to the next installment. 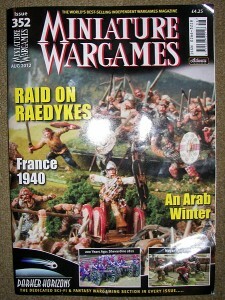 As usual Steve Eardley’s monthly instalment of reviews and views on wargaming makes me think and laugh. Just what you want! 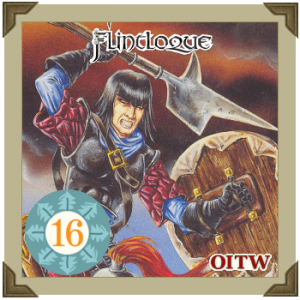 Topic this time is humour in gaming…something the writer of Flintloque knows all about. Jon Sutherland does a grand job on Gettesburg but to be honest I skimmed this article as I seem to see so much ACW and articles on Gettysburg that it seems to blend together. One for Civil War USA fans. An after action report or AAR (this American term seems to have totally killed the British term Battle Report in the last couple of years) by Russ Lockwood on last issues’ scenario for WWII. A good read but it did seem to take up about two pages too much space. The normal rambling star of every issue delivers gold again. Darker Horizons is several pages of gold for Sci-fi and Fantasy players. Crammed full of release information, options, web addresses and general ranting it is worth the cover price on its own to me. Well done Gary Mitchell. I am looking forward to when this section gets its own magazine. 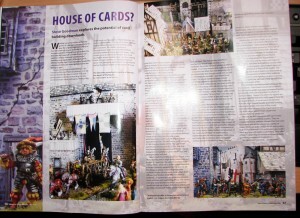 This two page article is all about making your wargaming buildings from paper and card rather than from resin or plastic. This is a superb feature by Steve Goodman that I re-read several times. It is also the first time I have seen paper given this space in a magazine for a long time. For those interested check out Dave Graffam among others. There were a few parts of the magazine of special interest to me and perhaps to fans of my work and of 15mm.co.uk in particular. Advert for the USE ME Series on page 4. A prime slot! Gary Mitchell gives me high praise on page 21. While all true it did make me blush! 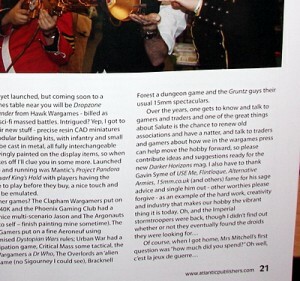 After my look at the great free Wargame title Irregular Magazine I struck up a conversation with Dave Barker from the mag and after a chat I offered to write an article for the summer edition (yes, I talk myself into all kinds of things!). But to my credit when I learned the theme of the issue was to be ‘Mysteries of the East’ it gave me a chance to make use of my knowledge of Japan and Japanese culture. So I put forward an idea and it was accepted! More on this when its time but my good friend Sam Croes has agreed to create a piece of art for use with the article. And what is the article…well did you know that in the 23rd century all disputes in Japan are settled by the use of giant robotic sumo? I shall say no more.